I pride myself on having developed, nay mastered, a habit of reading and watching television at the same time, without missing anything. This killing of two birds with one stone came in handy recently while I was simultaneously paging through an issue of Time magazine and watching Forensic Files on eTV. Just as I am absorbing this information in the article, McDonald’s new Big Mac commercial comes on the screen, boasting of superheroes and the introduction of the new super (grand) Big Mac. Infuriating! I felt like pulling an Elvis at my screen – The King reportedly had a habit of shooting his television sets – but, thank God, I do not have a gun. What is my beef (yes, ha) with McDonald’s? Well, a few weeks ago I stopped at the McDonald’s in Nelspruit, across the road from the SARS offices. I was actually stopping for a cup of coffee but decided to buy a Big Mac for my nephew’s kid. Then, having been running around Nelspruit the whole day without taking a break for sustenance, I succumbed to temptation and tucked into the Big Mac while driving back to Barberton, fearing my demise from hunger before I reached home. But what I found myself eating was far from a Big Mac. As one who not only grew up in the US eating the likes of the Big Mac – I still remember their slogan, “Two all beef patties, special sauce, lettuce, cheese, pickles on a sesame bun” and that we called the joint Mickey D’s. But what I bought in Nelspruit was no relation to the Big Mac described in the advertisement. Certainly not the Big Mac I had been accustomed to. First, the so-called “all beef” patties better resembled two flat, circular pieces of biltong. As for the lettuce, it was like crumpled wet paper and the cheese was negligible. Moreover, verifying that this was not anything close to the “real deal” was the lack of the “special sauce”. This special sauce matter is key. You see one of the joys of eating a “real” Big Mac was that the sauce, along with the pickles, would drip on to your fingers. In those days, eating a real Big Mac with one hand while driving would have been impossible, or at the least, very messy. I am kicking myself for having finished this strange object dubbed a Big Mac because if I had saved at least half of it, I could have sent it for forensic testing. Now I simply have to take Mickey D’s marketing word that what I bought was a Big Mac. Kearns was so right about how much we are being marketed to. I describe it as being lied to, like an apple a day will keep the doctor away. Yeah right! Strange, that Mickey D’s new commercial markets this new grand Big Mac. 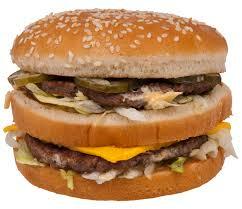 If you have a proper Big Mac, you do not need one that is super, grand or whatever. The original – or better said – real deal is super, grand enough. Ronald McDonald is not a happy clown, at least not here in the RSA. So Mickey D’s RSA, stop taking us for a ride! A Big Mac is a Big Mac! Now, in closing my consumer protection piece I must once again mention my friends at Mr Price. Some issues back I wrote about the belts I had bought at the store – belts which soon tore and had me walking around, gathering stories and trying to shoot pictures – all while trying to hold up my trousers. Kudos to Mr Price they not only responded, explaining that they also carried better-quality belts at their stores, they sent me two complimentary belts just to prove it. Okay guys, no, I am not looking for another freebie, but I think you need to know that last year I bought several pairs of the Oakridge brand chinos, with one being black. And a few weeks ago, desperate for a clean pair of trousers to wear to a farmers’ day (I had not done laundry in a while), I remembered the chinos and pulled out the black pair. And when, soon afterwards, I caught up with the laundry, they joined the pile. I am a self-sufficient man in matters of housekeeping (having lived alone for many years or with women whose favourite song seems to be, “I am woman hear me roar”). Of course I washed the black chinos separately but when they dried, what I got was a pair of trousers that had turned into camouflage gear, with black and brown shades that would have better suited US Special Forces. There was a warning attached – which had I noted when I bought them – that said something like the dark colour will fade with washing. Thanks for the warning, guys but fading and camouflage are very different.